Sammy Clingan has signed an 18-month contract with the Rugby Park club. 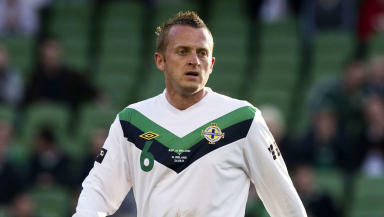 Kilmarnock have completed the signing of midfielder Sammy Clingan following the player's release from Doncaster Rovers. The 29-year-old Northern Irishman, who has 33 international caps, has signed an 18-month deal at Rugby Park. Kilmarnock manager Kenny Shiels said that he was delighted to be adding a proven player to his squad following high-profile departures this month. Midfielder Liam Kelly signed for Bristol City and defender Michael Nelson quit Rugby Park for Bradford City. Gary Harkins has also left the club, returning to former side Dundee. "Sammy is a really good player," Shiels said. "He passes the ball well, gets into good positions and knows the game so he is one we need badly"
Though registered in time for Wednesday's match against Celtic, Shiels said that he would not put Clingan straight into the first team squad. With a lack of regular football in recent weeks, Shiels said Clingan would play games in the Under-20 side while training with the first team to ready him for the SPL.